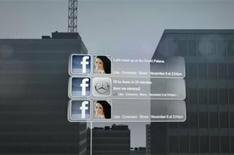 Mercedes adds Facebook on the move | What Car? Mercedes will bring Facebook to its cars from 2013, it revealed at this year's Consumer Electronics Show in Las Vegas. Alongside Facebook, Mercedes drivers will also be able to log on through the vehicle's Comand system and use services from Google, including Street View. However, many of the services provided will be available only while the vehicle is parked. Fans of Facebook will get a streamlined version of the social media site. The Mbrace2 Facebook screen lets users check their wall, news feed, friends, places and events. Drivers are able to change their status using preset updates based on location and destination while on the move. They can also locate friends who've 'checked in' nearby, and find local businesses while on the move. More personalised functionality such as the ability to write bespoke status updates becomes available when the vehicle is parked. Mercedes will also offer apps for smartphones that link to the Mbrace2 system. These will let drivers monitor their vehicle's use and generate diagnostic information about their car's mechanical state of health alerting the owner and dealer to potential problems before they fully develop. All the apps will be available for IOS (iPhone) and Android smartphone platforms. The features use cloud technology, so owners can use any compatible smartphone to check up on their vehicle. Mbrace2 will be rolled out across the range from 2013 in the US. There's no confirmation yet as to when the technology will arrive in the UK.